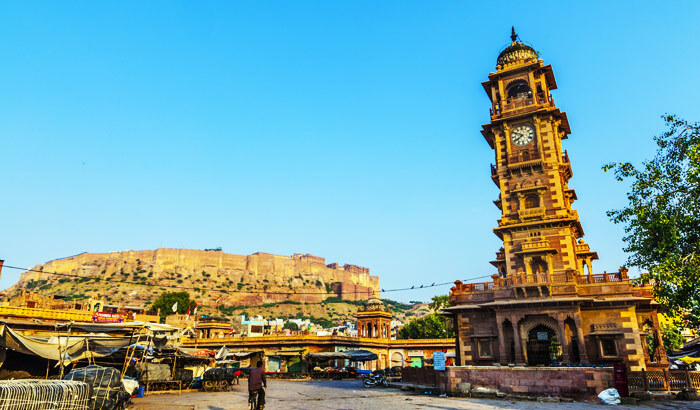 Jodhpur Old City Day Tour is starting from Jodhpur where you will see the clock tower, local bazar, blue city walk. The Duration of this tour is approx 8 to 9 hours and distance may be approx 70 to 80 KM. Jodhpur old city Day Tour Start from Jodhpur. tour is start 9: am and come back at Jodhpur office on 5:PM we start our tour From Jodhpur Fort, Clock Tower. Ghanta Ghar is also known as the clock tower of Rajasthan, is in the Indian city of Jodhpur. It was built by Maharaja Sardar Singh from whom the market takes it a name. In fact, the tower dominates the entire scenario. In Local Bazar of Jodhpur, you will see The large array of Rajasthani items in Jodhpur local markets also includes silver jewelry, marble figures, paintings, ivory, bed covers, puppets, pottery, and memorabilia. It is not only the variety that makes the difference but the pricing which is in your budget. Bluecity Walks offer customized Heritage Walks, around the 15th century, historic town of Jodhpur through beautiful temples, busy markets, and famous blue havelis. You can read history in books, but you can’t feel it, till you don’t pass through the walls of the old city which have been marked by the colors of history Jodhpur old city Day Tour Finished at Jaswant Thada and Drive back for Jodhpur city and Drop at Hotel and Airport. Car Hire in Jodhpur book a cab online with Taxi Service in Jodhpur. we provide online booking easy and save time.